Don used to work on one of the telescopes and so he was able to set up tours of both the Suburu and the Keck telescopes. This was absolutely incredible as we got to see the parts that normal tourists do not. I took a small movie of the Keck moving but did not capture the entire range of movement. It was quite cold and I took advantage of the proffered yellow windbreaker with flannel lining for the Suburu. I had been worried about breathing in this rarefied atmosphere—14000 feet above sea level. We check my oxygen content several times during the trip—it dropped to 85% and although I was functional, I could not have done any work at that level. The Keck operators wore oxygen concentraters and oxygen was available at every level. Don had read that a dose of Advil would ward off mountain sickness and so I took two and Glen took one—we seemed to have few problems although if asked to do any meaningful work, we would have been challenged. The ranger station has a feel of a small college union—with a friendly cook, flags from every nation hanging in the lobby, and huge boxes of cereal and condiments, plus posters of healthy eating proportions. The rangers go up the mountain and stay for several days, sleeping in what looks like dorm rooms. Night visitors to the mountain are common as that is the best time to see stars. We were able to get a glimpse of Saturn but the wind was blowing so hard the small telescopes jiggled. It was good to get back in the car and warm up. Since all of this activity took place in the afternoon and evening we had the day to spend—first Don and Glen returned a truck Don had worked on—placing humorous stickers on its bed—it resembled a worn dumpster—the salt air and humidity are not kind to metals. Next was a trip to a friend’s house to pick up some wood to be sawed into planks while I was dropped off at the Fabric Warehouse. It was a good thing I had just a small space in my luggage but I managed to control myself somewhat. 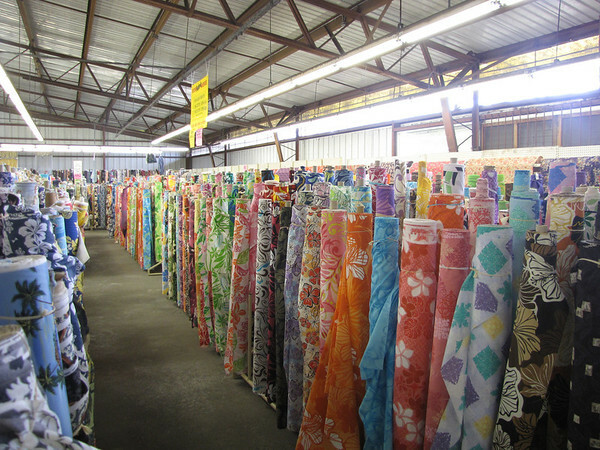 Rows of aloha wear fabrics were on display with everything from huge hibiscus flowers to surfer trucks and Elvis.